Contrast is all about which colours you use together in your home’s colour scheme. Avoid a pale-on-pale colour scheme as sight impaired people use colour contrasts to find objects and the edges of objects. These tips for your home decorating help with contrast and colour choice. 1. Paint your door frames and doors in a colour that is different from your wall. A lighter colour works well, allowing the vision impaired person to tell where the door is and whether it is open or closed. 2. Glass doors should be marked with a colourful strip or try bright stickers at eye level to make it easy to judge if the door is open or closed. 3. If your home has stairs, mark the edge of each step clearly. You can do this by painting the rise of the step in a light colour and have the step itself in a dark colour - such as cream rises and a lovely oak floor and step. 4. Where rugs and carpets are necessary, select a colour that is clearly different from the floor colour. 5. Co-ordinate all your bathroom mats and towels and pick a nice bright accent tone. Choose co-ordinating bright soaps and bathroom products. 6. If your bathroom fixtures and tiles are all white, it can be difficult for a sight-impaired person to see the edges of the bath, basin, shower and toilet. 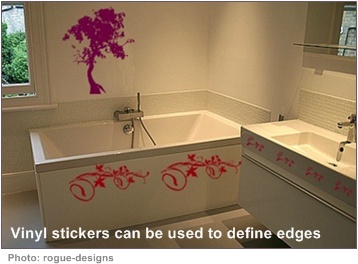 Use bright patterned vinyl stickers to mark the edges of fixtures and shower doors with a funky design and fit a dark wooden toilet seat. You could make a lovely design on the outside of your pedestal basin if you don’t have a countertop. 7. 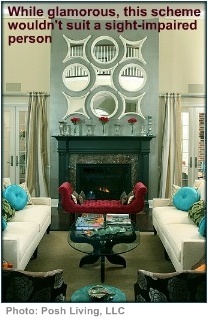 Mirrors can be an asset in home decorating. Help partially sighted family by ensuring that your bathroom mirror has a dark frame around it to make it easy to identify. 8. Choose kitchen countertops carefully, making sure that items such as pots, plates, cups and bowls can be clearly seen on them. Your appliances also need to contrast with your worktops - you wouldn’t pair black granite tops and a black ceran hob. 9. Your kitchen cabinet doors need to be distinguishable from the walls and floors. The contrast helps a sight-impaired person to locate the doors and also to be able to tell if a door is open or closed. Choose handles that are darker than the doors. Cup-pulls are fashionable and large enough to be seen. Good furniture selection and placement makes mobility easier for the partially sighted. Here is some more home decorating help for a beautiful and safe design. 1. Rugs are easily tripped over. If you want to make use of area rugs, make sure they are large and secured to the floor with a rug underlay or rug pad specially designed for this. Also choose a rug that contrasts with your floor. Remember light on dark or dark on light. 2. When someone has a restricted field of vision they may bump into low objects. Make sure that low tables are out of the path normally walked in the room. 3. Keep your rooms open and uncluttered. Try not to over-furnish so that you don’t end up with too much furniture that has to be arranged closely. This is very difficult to navigate when someone has poor vision. 4. When you choose your colour scheme, keep it simple - using too many colours or very busy patterns can be confusing for a person with poor vision. By using this home decorating help your home need not be bland or boring when decorating for someone with impaired hearing or vision. Just keep the basic principles in mind and you will create a lovely space that is both functional and beautiful.